Today we’re starting a new contest – surprise! This is not one of the three previously scheduled lithograph contests but an ALL NEW one! Warner Bros. is releasing the UK 25th Anniversary Celebration Edition of Chess in Concert DVD and double-disc CD on September 14th (in the UK), the day after the big ABBA-tribute “Thank You for the Music” concert being held in Hyde Park, London. 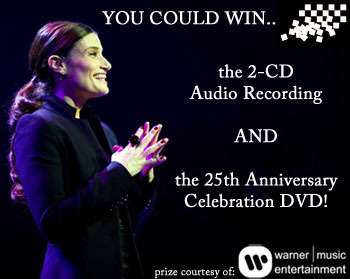 To thank you all for being awesome fans, Warner Bros is giving away a copy of the special edition DVD & double-disc audio recording to one lucky Idina fan! Click the image below to be taken to the entry form. Rules and details can be found there. Good luck! Note: Since there was already confusion – YES, we’re giving away the IDINA VERSION of Chess.